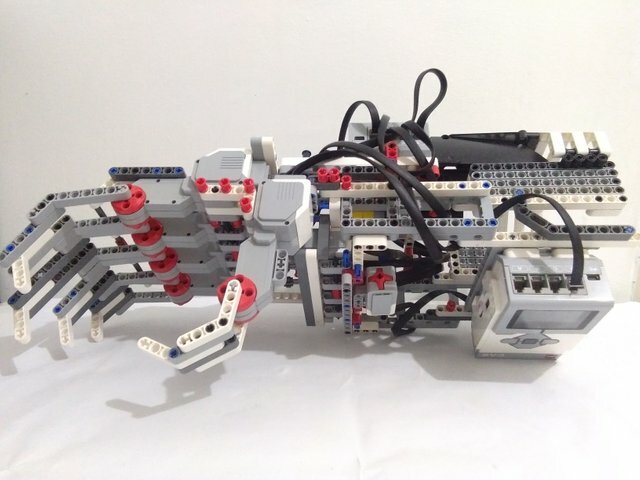 WEARABLE ROBOTICS: MY OWN VERSION OF CYBORG HAND USING EV3 LEGO SET. There are already firms that are currently developing a robotic suit, to name a few we have Honda, Daewoo, Cyberdyne, Toyota, and DARPA. For me, these kinds of development are something very interesting, it feels like Ironman suit is becoming real rather than being a science fiction. There is also a trending video of an actual attempt to create an ironman suit wearable design by some technologists from Japan. Wearable Robotics. What comes first into your mind when you hear these two words? Well for me, it’s the ironman suit. It is fun for me to delve into my imagination but let’s get out first from the sci-fi realm and take a look how powered exoskeleton and wearable robotics will aid in favor of humanity. 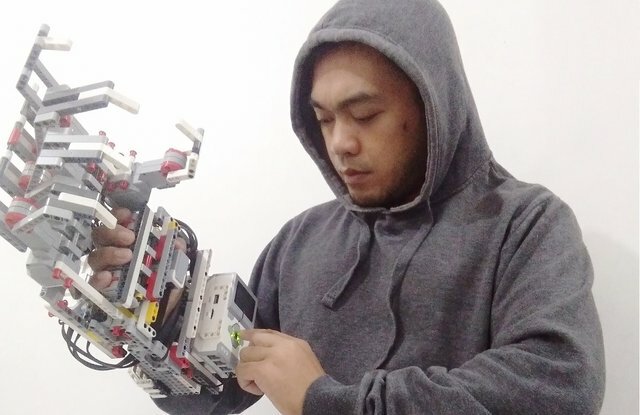 Yes there is always two sides of a coin, and others even fear the emerging developments in technology nowadays such as artificial intelligence but in this post I just want to focus my own perspective on the bright side of wearable robotics as well as showing you my own version of a wearable robotic hand, which is made of Lego Mindstorm EV3 Education Education Set. 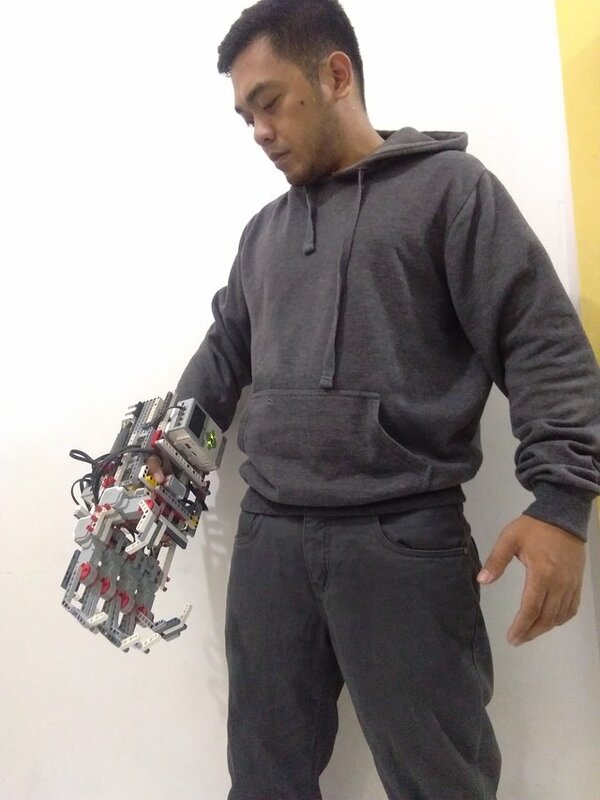 I included a video at the bottom of this article showing this robot hand that I built in action, feel free to scroll down if you want to see it right away. In my opinion, we are not very far in being able to put powered exoskeleton or wearable robotics into perfection. What I mean by perfection is when a person with spinal injuries will be able to function fully in their lifetime with the aid of wearable robots. The image above shows a man wearing the Hybrid Assistive Limb developed by Cyberdyne. This technology will play a significant role in the medical field, nowadays engineers and developers are actually building robotics suits to be able to help people with leg paralysis to be able to stand and walk again, with the continued research and development in this field, man will soon achieve the perfect robot suit that will enable people with paralysis to live normally. Take a look this website of Kinetec , a company that provides robotics solution for medical field. 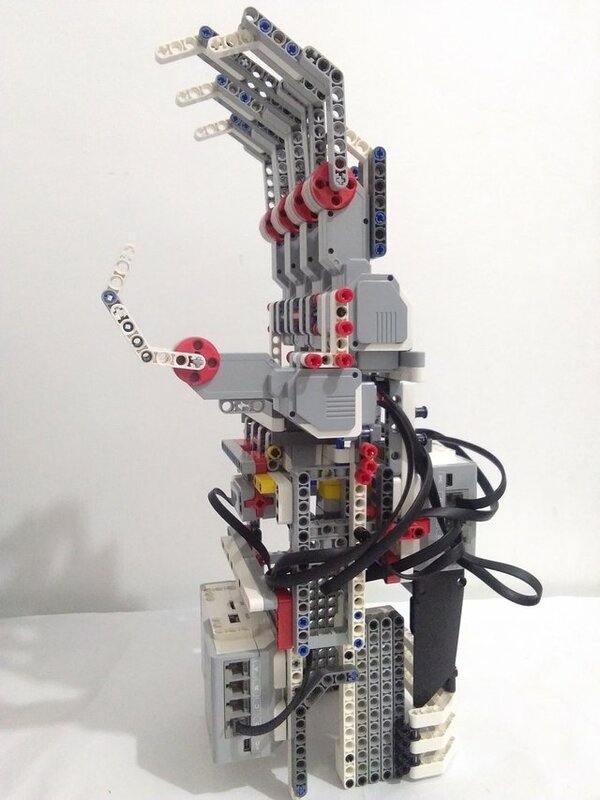 With this in mind, I just thought to share with you my own design of a wearable robot hand prototype, just with the use of powered-lego. 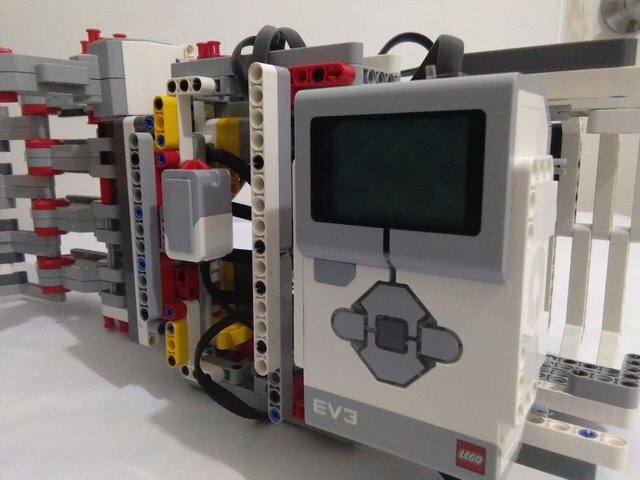 That’s right, just with legos if you have been following my previous blog, I had been creating robot prototypes just with the use of Lego Mindstorm EV3 Core Set. You will see here five motors to power the thumb and the rest of the fingers. 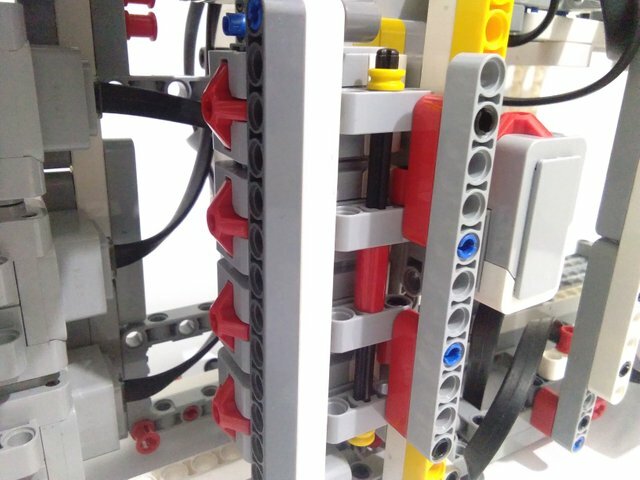 The red looking wheels with holes on it are the tip of the motors. Five touch sensors are installed, one sensor is assigned to trigger movement for each finger. The sensors here are the pyramid-like red projecting buttons. 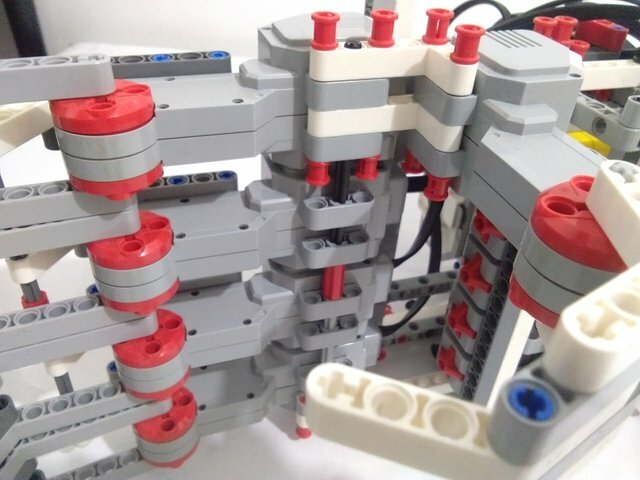 This is the programmable brick (Serves as central processing unit), this one is located at the backhand part, it has only four ports for motors and another four ports for sensors, so the motors that controlls the fore-hand fingers are connected here, as well as the touch sensors that triggers their movement. 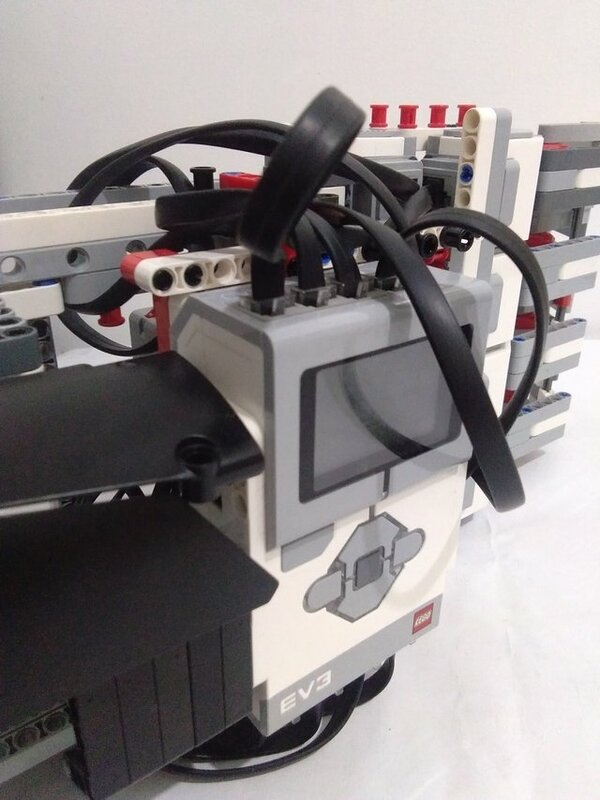 To complete the five fingers, I installed another brick to accommodate one more motor and touch sensor for the thumb. This one is located at the wrist part of the hand. I intentionally designed the fingers to have different lengths to add a realistic feel of a human hand. And here how it looks like when I wear it. 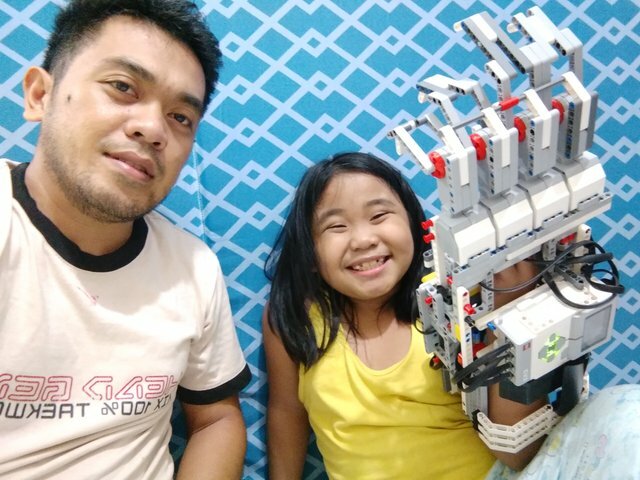 Let me share also a selfie with my daughter wearing the prototype. wow man, you are genius ....that would great contribution to relief humanity. Thanks for dropping by. I appreciate your comment. Thanks for the support. More power to your project. That's a nice and cool build. Thank you so much for the support @kendallron, my deepest gratitude to @c-squared and @curie and of course for the entire #steemit community. It'll be my pleasure to create more content of this kind coz my passion lies in it. Have a good one. hehe yeah, I am also grateful to @bestofph, I remember some of my older posts were also featured by them. Thanks again.